Hello All! I'm Jess from Lovely Jubbly, and I write a beauty and lifestyle blog, and today I am doing a guest post for the lovely Shona (Who's blog I thoroughly enjoy!) 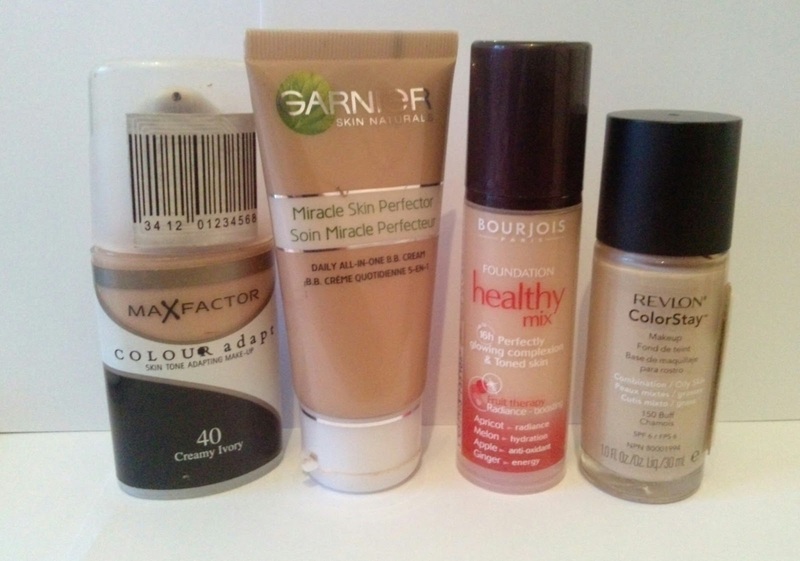 I thought I'd share with you my favourite foundations, from the 'drugstore' a.k.a Boots & Superdrug in the UK! Foundation is something I couldn't live without, although I like the natural look in terms of neutral make-up and nothing too out there and loud, I wouldn't dream of missing out foundation from my daily routine. I'm guilty of even wearing foundation on days where I lounge around in my PJ's all day! So, I've picked for 4 favourite foundations - all of which are readily available at Boots or Superdrug, and are relatively affordable in comparison to the higher end foundations that retail from £25 and upwards! This particular foundation is almost a mousse consistency, but in a pump bottle. I find the coverage very good without looking cakey, and this is my go-to when I am feeling quite pale as this shade is the palest of the above 4. I find this does need a powder to set it, so it's not the best for oily skin - but when my skin is behaving and feeling 'normal' then this is great for me. I haven't tried any other max factor foundations, if you have any suggestions please let me know in the comments below! This is probably my favourite of all 4, and this is my current foundation. I'm pretty sure I have been through 4 bottles of this super lovely foundation and I finally feel as if I have a 'me' foundation. The coverage is perfect, the finish is lovely and it also works well with powder which is great as I have combination/oily skin. The shade is a very good match, and this is usually on offer somewhere for 3for2 so I always stock up on this. I think the healthy mix will be a favourite for quite some time! Have you tried this? This is my go-to foundation on days where my skin misbehaves, and quite frankly I need the coverage. This is a very long lasting, thick foundation that provides medium/heavy coverage as it is buildable - however, it also doesn't appear cakey which I like! Again, this would be a repurchase for me - I only wish the bottle had a pump, as I find a waste an awful lot of this foundation due to the packaging. That's it from me, thankyou to Shona for letting me write a guest post for her blog - hope you enjoyed finding out my favourite foundation. What's yours? If you have any recommendations feel free to leave them below. I'm a big fan of the Bourjois Healthy Mix and Revlon Colourstay too. They're both my go to drugstore foundations. I tend to use Healthy Mix on days where my skin in good, Colourstay when my cheeks are really red although I have found during harsh weather Colourstay goes a bit dry on my skin. Really love them both though! colourstay is awesome for covering any redness - I find it perfect for days when my skin isn't behaving. These same like great buys!